For many people, pets are family... and because of that, we don't hesitate to spend money on our pets. The most regular costs are things like food and treats, plus less frequent expenses like vet bills. When it comes to dog supplies, though, sometimes we hesitate - would we ever use them? Do we even need them? How much are they?! But some pet supplies can make pet ownership not just more convenient & more fun, but it can make life easier & more fun for your dog, too. It's not just professional dog trainers that invest in supplies for their dog. 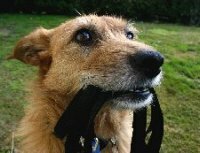 Simple things like a clicker (used in positive-reinforcement clicker training) or even a specially-made harness that helps dogs learn not to pull on the leash are fairly inexpensive supplies that can help teach dogs good manners (in conjunction with your time and help, of course!). Another type of supply that some dog owners may be interested in is agility equipment. Some people and dogs find agility a lot of fun and a great way to socialize as well as get some exercise. Think of an obstacle course with all sorts of neat equipment like tunnels and ramps and jumps! Doggy toothbrush and specially-made canine toothpaste (do not use human toothpaste on your dog - it's far too strong!). Supplement your pet's dental hygiene program by using a dental spray, gel, or rinse too. Always keep a good stash of dog bathing supplies on hand. Even if you very rarely bathe your dog, all it takes is one good roll on a dead fish (...or in swampy mud, or in the millions of other things that dogs find utterly delightful) and you'll be glad you have those bath supplies readily available. Floods, wildfires, hurricanes, and other natural disasters can cause you to need to leave your home in a hurry. Bring your pet with you - he cannot fend for himself! Put together a minimum basic disaster supply kit for dogs just in case of emergencies. There are so many types of dog supplies available to pet owners. Even though we may wonder if we really need them, many supplies make pet care easier, more convenient, and sometimes even more fun, too. Plus they're handy to have around in case, say, your dog decides that it's a great idea to burrow through that mound of rotting fish he found on the beach.